One hundred meters eastern of Adipura Park is the location of Museum and Keraton (Palace) Sumenep. The old building on the right side of the road is a place for keeping a gold carriage, a gift from Queen of England to Sumenep King. Beside that, it is also used to keep other inheritance, like; old chairs, old table and the other inheritance. 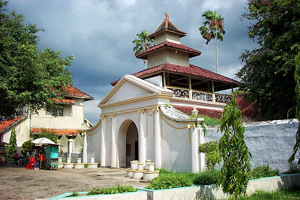 Sumenep Royal Palace (Keraton) is listed in front of Museum. This palace was built in 1762 in the reign of Tumengung Arya Nata Kusumo I. It consists of Gate, Pendopo, Palace itself, old Palace and Sare Park. The Gate is located in the left side of the palace. It is a great gate with Europe style. It is popular called Labang Mesem (Smiling Gate), an entrance way to the palace complex. Pendopo ( a meeting hall ) is a hall placed in the center of palace complex used for holding a meeting. It is a simple but unique building completed with beautiful style. The building that related pendopo to the palace called Mandiyoso. It is a building about 25 meters long from the palace to the Pendopo. Sumenep Palace consist of two floors. The first floor has four rooms. Two of them on the right side and the others on the left. The second floor is a a place for keeping the princesses when they would come to a marriage. On the right side of the palace there is also an old building named Kantor Koneng. In the last time, it was a palace of Bindoro Saod before he handed to his successor. Now on, it is functioned to keep many kinds of old weapons used in long ago, old traditional ceremony tools, old bracelets and rings of people in the long time and the others. On the back of Kantor Koneng there is a building functioned as museum to. It is used for keep the remnants of Sumenep Royal Palace, the uniform of king, some old chairs and beds, and the new one is a skeleton of hawk found on the Kalianget shore in 1977. On the left side of Pendopo is Sare Park. It is a park with a small swimming pool of which the water come out from base. In the last time, it was used specially for the princesses.